When John Gardner wrote his 14 book James Bond series in the 1980s and 90s, he also penned an original series of espionage novels featuring his own MI6 agent, Herbie Kruger. 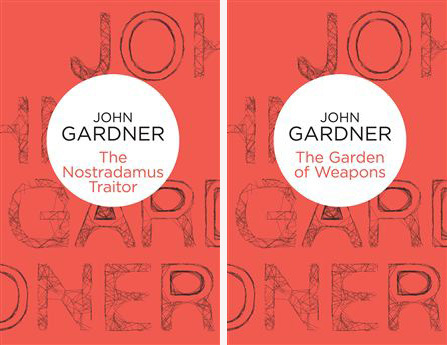 Gardner's five Kruger novels were: The Nostradamus Traitor (1979), The Garden of Weapons (1980), The Quite Dogs (1982), Maestro (1993) and Confessor (1995). Now Bello, as imprint of Pan Macmillan, have brought John Gardner's five long out-of-print Herbie Kruger novels back to readers as new trade paperbacks and ebooks. You can purchase all five Herbie Kruger books direct from the Pan Macmillan website or Amazon.co.uk. These new Bello print and eBook editions are not available U.S. and Canada. However, you can get new Kindle editions in the U.S. from Mysterious Press/Open Road via Amazon.com. Thanks to Sarah at Four Coleman Getty. That's fantastic! I thought the Herbie Kruger novels were excellent. I'll never understand why they didn't receive more fanfare. 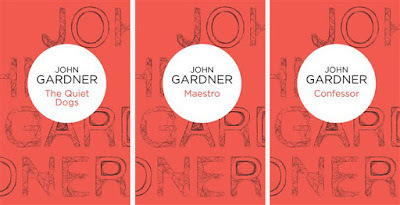 Hopefully, readers will snap these up and realize what a great espinage writer John Gardner really was. And, if we're lucky, they'll start reprinting the Boysie Oakes' series and Secret Families' trilogy. This is great news. The Herbie Kruger books I've read are fantastic, and they deserve to be rediscovered! I really hope this leads to an American publishing deal as well for the physical books--and ideally to audio books, also. If you like Deighton and le Carre, you should really check these out. Are these worth a read? I've recently picked up the first half of the Gardner Bond novels, but I've yet to start reading them. If I enjoy them are these worth a look too?